Barkley wins the CMDRA Season Finals and captures his 17th National Championship! 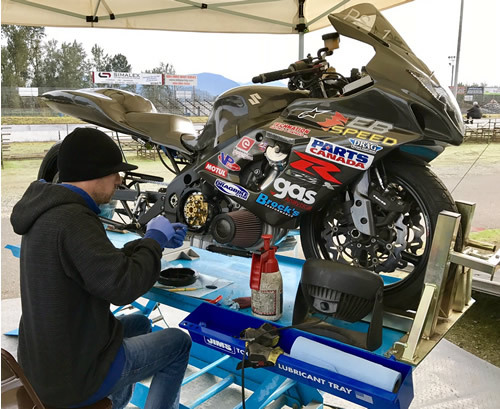 Ethan had his hands full after the Oil City Nationals where his turbocharged GSX-R1000 "Eleanor" suffered a blown head gasket. After some late nights in the EB Speed shop Ethan had the repaired engine installed and running within five days. Unfortunately there wasn't enough time to properly test the engine prior to the CMDRA Season Finals at Mission Raceway Park Sept. 23rd -24th. The new motor wouldn't get much of a break in as it was immediately put to the test on Saturday morning's opening pass and it performed great..a little too great! The bike initially launched well but the front wheel began to come up into second gear and Ethan was forced to abort the run. The cool fall temperatures combined with sea level air density meant the engine was making a bit more power when compared to the previous high elevation tracks he had raced at earlier this season. If he wanted to post good times, Ethan had to come up with softer power delivery heading into qualifying. In the first round things were beginning to look up as Ethan didn't have to chop the throttle as much and made a relatively clean pass of 7.49/186 MPH! This was a great run considering the other racers in the class struggled to break into the seven second zone. A few slight adjustments were made to the tune for round two but it was to no avail as the front tire went skyward immediately and Ethan was forced to once again chop the throttle, ruining the pass. In the final round of qualifying Ethan substantially toned down the power delivery; "I just need a clean A to B run without any drama, then I'll have some useful data for Sunday" he said prior to the run. He was on point as the front tire stayed down and he could just tuck in for the ride, 7.41/190 MPH flashed on the boards! It was a great pass that was over three tenths of a second ahead of his nearest competitor. Ethan earned bonus points for qualifying atop the field giving him a 45 point lead in the EB Speed Pro Street class championship standings heading into Sunday's eliminations. Ethan setting up his MTC GenII clutch for the opening test session. Saturday evening was spent pouring over the data in order to better the performance for Sunday. Ethan knew the bike had a lot more potential than the posted 7.4 and was determined to take full advantage of the great racing conditions. His decision was a mix of adding a bit more ballast to the front of the bike, softening the ignition timing as well as a slight lowering of the initial boost request as the clutch lever comes out. Otherwise the bike was perfect, tracking straight and the motor was performing great with 190+ MPH on the last pass. Ethan stays low on his way to another 190+ MPH pass! The weather on Sunday was picture perfect, but the track wasn't as good as it was Saturday. Ethan spent a considerable amount of time on the starting line while the track staff prepared the track. After the first round of sportsman bikes, Ethan asked the Mission Raceway staff to put more "glue" on the track for the first 330' in order to improve the grip for the Pro classes. With the improved grip Ethan knew he had an opportunity to apply more power in the morning test session. Ethan was on a solo pass so he edged the bike into the starting line slowly making sure everything was just right before he staged. He left the line perfectly and hit his shift points as he sped down the track, the time came up on the scoreboards; 7.240 / 192 MPH... a new personal best! This was just slightly quicker than the CMDRA Pro Street record of 7.248 that he set last year in Edmonton however since this was in testing and wouldn't count for a record. Unfortunately there wasn't much time to celebrate as the opening round of eliminations was only one hour away and he and his crew needed to prepare "Eleanor" for the quarterfinals. The plan was to leave the settings the same to see if he could duplicate the run and he did just that running a 7.269 / 190 MPH. Going into the semi-finals Ethan was faced with a bit of pressure since he needed to get the win in order to lock up the season title. 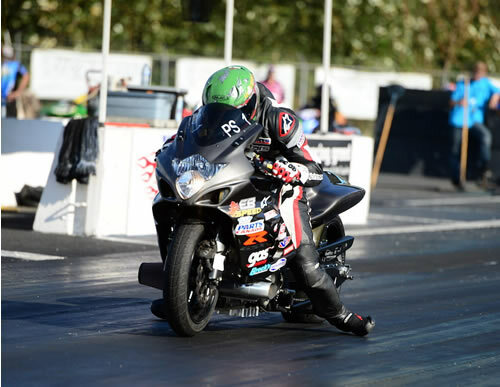 He isn't one to play it safe but sometimes the big picture is more important than the individual races so a softer more predictable tune was chosen and Ethan took the win over fellow EB Speed rider Dan Green with a 7.33 /189 MPH to Dan's 7.98 / 184 MPH. Now Ethan could breathe a sigh of relief knowing he just clinched the 2017 EB Speed Pro Street Championship! 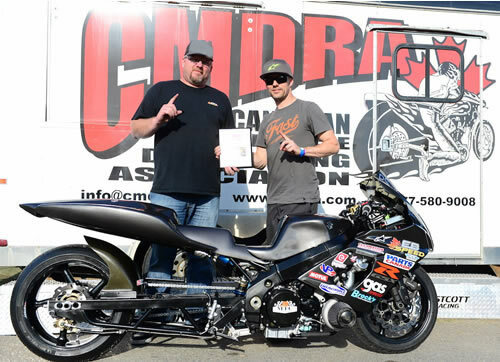 Ethan and crew member Chris take the win at the CMDRA Season Finals! With the weight of the championship off his shoulders Ethan could focus on going as quick as possible heading into the finals. The boost settings were left nearly identical to the morning passes, so it was up to Ethan to hit his marks even more precisely during the final pass of the 2017 season. His competitor Rob Aston had a slight edge as the lights flashed green, but within an instant Ethan was passing Rob and pulling away. Ethan tucked his head down and pulled his elbows in as he clicked his shift button though all six gears. He not only took the win but made history doing it, 7.228 / 194 MPH! 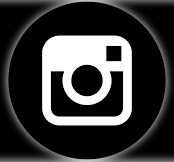 A new CMDRA E.T. record! "I couldn't ask for a better way to close out the season!" Ethan stated after the run while receiving congratulations from his crew, family and fellow racers! Ethan holds the coveted CMDRA Pro Street #1 plate for 2017! 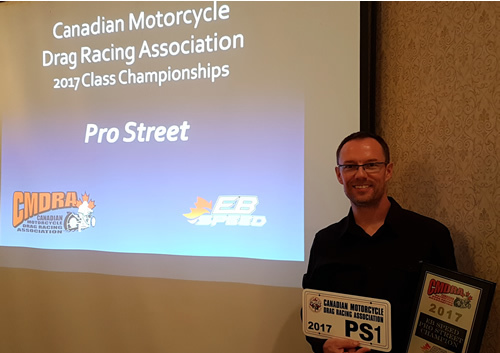 The 2017 CMDRA four race season was one to remember for Ethan as he had excellent results in the EB Speed sponsored Pro Street Class with two wins and two second place finishes. Combine those results with a new E.T. record on the final pass was a great way to cap off his 17th Championship title. Ethan would like to thank his sponsors, crew, family and friends for all their support.